Stripes over Stripes and a Splash of Red (Look 16). You saw me style this jumpsuit for work a couple of weeks ago, where I layered it with a baby blue lace tee underneath and a baby blue silky blazer over it. Well, this is actually what I wore in real life for work, today. A second way to style this jumpsuit to work for today's post. 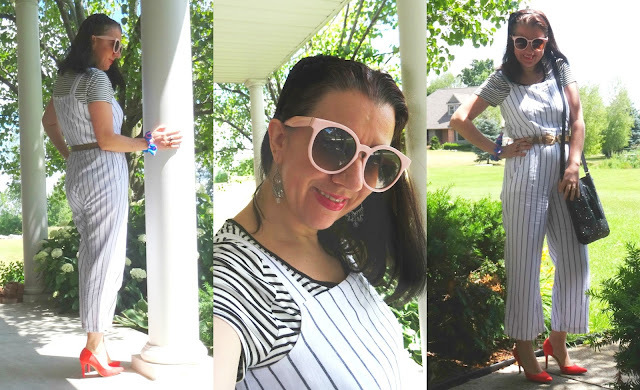 Since I had not one but two neutral striped tops included in my capsule wardrobe alongside this jumpsuit, I knew I'd try at least one of the striped tops with it. Since this t-shirt is semi-fitted I decided to pair it with the jumpsuit for a Stripes over Stripes Outfit. 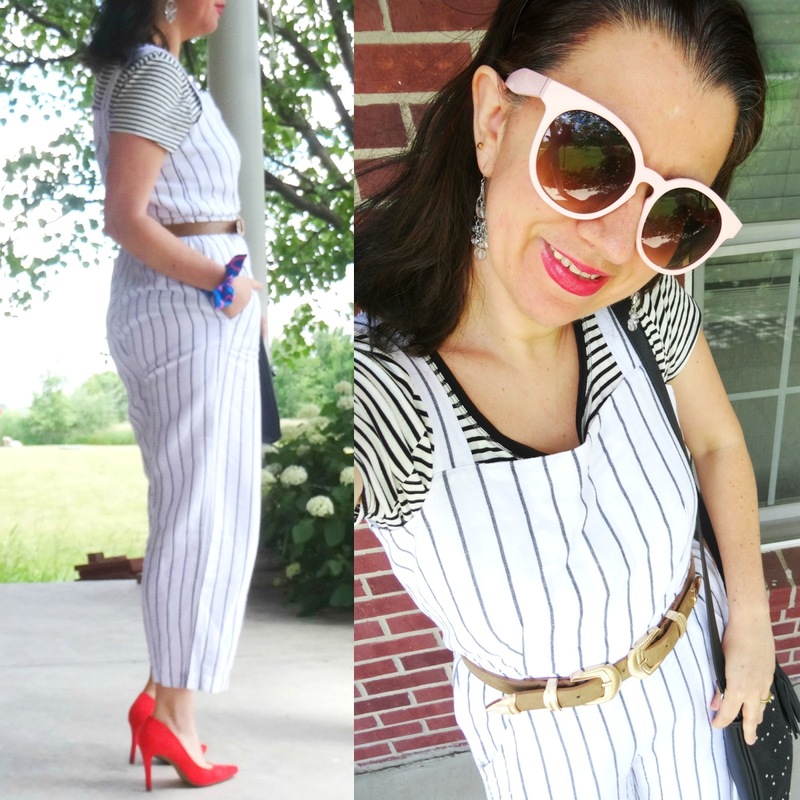 This White Linen Jumpsuit has navy stripes so with 4th of July less than a week away, I figured to do a splash of red and I did that with my Orange Red D'Orsay Pumps and Raspberry Red Lipstick. I love my New Black Laser-Cut Crossbody Bag by Express with the drawstring tasseled closing. I also love that I chose a Cobalt+Pink Patterned Bow Hair Elastic to wear as a bracelet. It added a little more blue to the outfit and better yet it matched the nautical feel of the whole look. And this Tan Double Buckled Belt looks fantastic over the jumpsuit, doesn't it?! Do you like how once again I styled this Wide-Legged Linen Jumpsuit to Work?! Taupe/Light Mocha Double-Buckle, Gold-Metallic Belt: Pitaya (very similar, Huge Steal), similar in light tan, on Huge Sale, love this), (similar in Black, Fantastic Deal, love this), (similar, Great Deal), (similar wide belt, Splurge, my Favorite). Black Satin Headband w/ Chiffon Flower: The Limited (similar, Steal), (similar, Great Deal, my Favorite), (similar, Splurge). Silver-Tone Beaded Light Chandelier Earrings: White House Black Market (similar, Huge Steal), (similar, Great Deal, love these), (similar, Small Splurge), (similar w/ pale pink stones, Splurge, my Favorite).